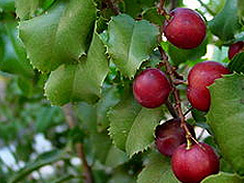 Hollyleaf Cherry (and its subspecies Catalina Cherry) is a wild fruit tree native in California (including Baja) chaparral. It looks a bit like an oak tree at first glance due to its tough leaves which have a slight tooth. I was out walking my dog, turned the corner from my house and noticed some squashed fruit on the ground. Puzzled, I looked up but thought I was standing beneath a slender oak tree of some sort. Looking closer, I noticed deep red-brown-purple balls hanging sporadically from thin twigs. And I thought I knew all of the fruit trees in my hood! Ha! I tasted the fruit on the tip of my tongue, found it sweet, so took a small cluster of leaves and fruit home to research online. 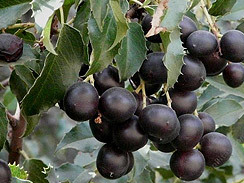 Turns out to have been none other than the Hollyleaf Cherry. Here in California, the tree not only grows wild, but is planted ornamentally too. Fruit ripens in high summer and varies in color from deep red to dark purple plum. Fruits are the size of a very large cherry or extremely small plum. In fact, the fruit in my opinion is closer to plum than cherry. Most of the fruit’s bulk is comprised of a pit around which a small layer of sweet-ish flesh grows. I say sweet-ish, because sweetness varies depending on how long the fruit stays on the tree. The cherries I tasted two weeks ago were sweeter than the ones still on the tree today. You can eat the fruit flesh straight off the tree. 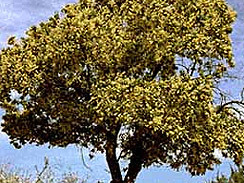 Native peoples made a fermented intoxicating drink from the fruit flesh, but their primary use for the tree was making flour from the pit’s inner kernel. After removing the pit’s outer layer, the kernels were crushed, leached like acorns to remove toxins, then turned into flour meal. You can eat those puppies right off the tree. Or, use the juice for syrups, fermented beverage. Use the fruit flesh for jams, etc. When that magical day comes that I actually have spare time, I’d like to try turning the kernels into flour.